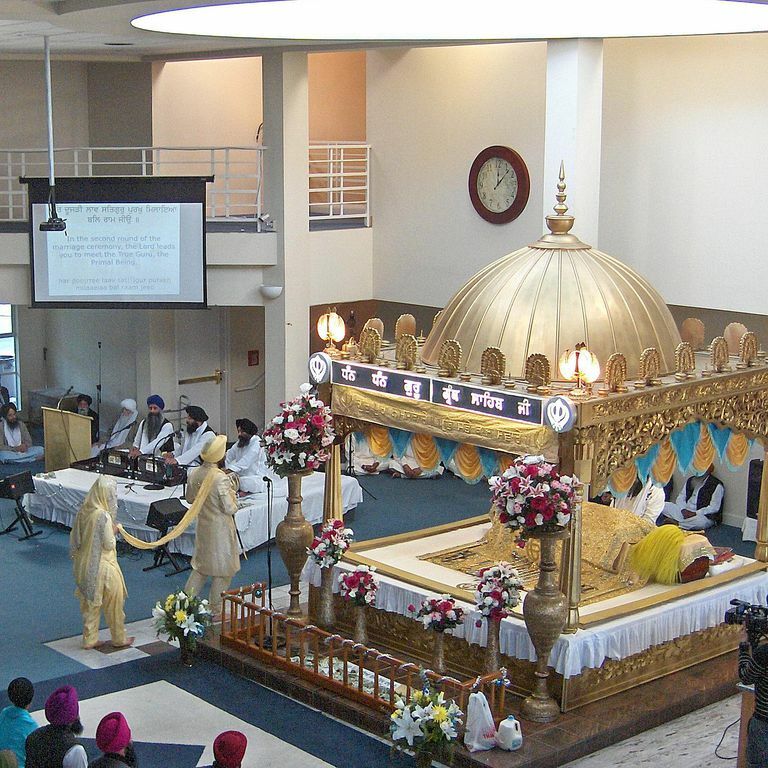 The four hymns of Laav are performed during the four nuptial rounds of the Sikh wedding ceremony. Each Laav describes a different spiritual stage of married life, ending with the soul-bride and divine groom realizing their ultimate destiny as one soul. The Laava hymns are compositions of Guru Raam Das (1534 to 1581 CE), which he wrote for the occasion of his own wedding to Bibi Bhani. Symbolically, the four Laava represent the fusing of the soul of bride and groom into one conscious being who is subsequently wedded to God in spiritual union. The verses of the Lavan are from the scripture of Guru Granth Sahib. The Gurmukhi words are spelled out phonetically here and appear above an English interpretation of their meaning. The English interpretation of the four Gurmukhi Laava is my own. The first verse of the nuptial round hymn asserts that marriage is encouraged as the best state of life for a Sikh. Together, the bridal couple bow in front of Guru Granth Sahib. Har peh-larr-ee laav par-vir-tee karam drirr-aa-i-aa bal raam jeeo. Baanee breh-maa ved dharam drirr-hu paap tajaa-i-aa bal raam jeeo. Dharam drirr-ahu har naam dhi-aav-hu simrit naam drirr-aa-i-aa. Satigur gur pooraa aa-raadh-hu sabh kilvikh paap gavaa-i-aa. Sehaj anand hoaa vadd-bhaa-gee man har har mee-thaa laa-i-aa. Jan kehai naanak laav peh-lee aa-ranbh kaaj rachaa-i-aa. The second verse of the nuptial round hymn conveys the awakening feelings of love a bride has when leaving her former life and beginning a new life in partnership with her husband. Har dooj-rree laav satigur purakh milaa-i-aa bal raam jeeo. Nirbho bhai man hoe houmai mail gavaa-i-aa bal raam jeeo. Nirmal bho paa-i-aa har gun gaa-i-aa har vekhai raam hadoo-rae. Har aatam raam pasaar-i-aa su-aa-mee sarab reh-i-aa bhar-poo-rae. Antar baahar har prabh eko mil har jan mangal gaa-ae. Jan naanak doo-jee laav cha-laa-ee anhad sabad vajaa-ae. The third nuptial round hymn declares the bride's detachment from the world and outside influences, as she becomes more deeply devoted to her husband wishing only to live for him. Ragis sing each verse of the marriage song as bride and groom, joined by the palla wedding shawl walk around the Siri Guru Granth Sahib. Har tee-jarr-ee laav man chaao bha-i-aa bai-raag-ee-aa bal raam jeeo. Nirmal har paa-i-aa har gun gaa-i-aa mukh bo-lee har baa-nee. Sant janaa vadd-bhaa-gee paa-i-aa har ka-thee-ai akath kehaanee. Hir-dai har har har dhun oup-jee har japee-ai mastak bhaag jeeo. Jan naanak bo-lae teejee laavai har oup-jai man bai-raag jeeo. The fourth verse of the nuptial round hymn describes a spiritual union of love and devotion where no feeling of separation is possible, creating perfect joy, and contentment. Upon completion of the fourth round, the bride and groom are considered to be man and wife. Har chou-tha-rree laav man sehaj bha-i-aa har paa-i-aa bal raam jeeo. Gurmukh mil-i-aa su-bhaa-e har man tan mee-thaa laa-i-aa bal raam jeeo. Har mee-thaa laa-i-aa mere prabh bhaa-i-aa andin har liv laa-ee. Man chind-i-aa fal paa-i-aa su-aamee har naam vajee vaa-dhaa-ee. Har prabh thaakur kaaj rachaa-i-aa dhan hir-dhai naam vi-gaa-see. Jan naanak bolae chou-thee laa-vai har paa-i-aa prabh avin-aa-see.